During the last decade, 1994 was the worst year (January – August) for Spain as a whole with 314,215 ha, followed by 1995 with 89,514; 1997 with 88,903 and 2004 with 86, 82. “Best” years were 1996 with 30,573 ha; and 2001 with 40,103 ha. The average surface burnt over last 10 years is 85.652 ha. There are said to be up to 20,000 forest fires in Spain a year. Between January and August 2004 there were 10,050, in comparison with 5,908 in 2003. An average of more than 80% of fires are caused intentionally. 59 people were killed in forest fires between 1991-2003. 41 of these died in 1994. In depth look at the problem of fire in Spain ( 25 min 41 sec). Click on play. More than half of Spain is at high risk from forest fire. 54.9% of Spain or 27,802,278 hectareas. This percentage rises to over 95% in Huelva. Comunidad Valenciana (99%), Islas Baleares 98.8%, La Rioja 95.5%, Madrid 89,3% Andalucía (81,5%); Asturias (69%); Extremadura (62.7%) Galicia (50.2%) Aragón (43.6%), Cantabria (5.7%); Canarias (12.4%) and Castilla y León (13.1%). A contentious word on the figure for the North-west. Much of the forest burnt was planted eucalyptus forest (see below). Yes, this is bad news for the owners and the people who live in the area. One might call it an industrial disaster, but hardly bad news ecologically. If there was anything more than token policy for reintroducing autochthonous species, one might even say it was a good thing, but as it is, reforestation in this damp corner of Spain will be swift. Eucalyptus is highly combustible but also regenerates incredibly quickly afterwards. There are hundreds of fires along Galicia 's coast of year, yet all along the Rias Bajas and Altas there is an almost continuous mono-crop swathe of these Australian trees. This birdless green desert is the true disaster of Galicia 's coast. Worst year for fire in last 10 years (El Mundo) From 1st January to 21st August there have been 20,952 fires and burning 129.438,6 ha. 33 big fires (more than 500ha) have been declared. 62% have occurred in the wetter north-west ( Galicia , Asturias , Cantabria, País Vasco and the provinces of León and Zamora ) . 54% more land destroyed by fire so far in 2005 over 2004 (Terra - Spanish) Until 31 May 11,842 fires, 66.46 more than 10 year average, 3 of which were +500ha. 40,190 ha in total. Northwest (61%) worst hit so far. Predictions at the start of a summer of a “complicated” summer in terms of fire have unfortunately been proven correct. Andalusia has been worse hit, having had its worst year since 1991 when 65,544 hectares were burnt. As of the end of August more than 42,500 ha had been lost, 72.5% of which were in the same part of Huelva, in the county of Andévalo and the surrounding areas. 27,839 of these hectares were burnt in 63 hours around July 27th in Minas de Riotinto in Spain's worst single fire since 1991. Two people were killed. A man is currently in custody charged with starting the fire. Trade-unionists and ecologists have blamed the ferocity of this and other fires on the neglect of Andalusia's forests, blaming the regional government for abandonment of the countryside and for not properly staffing the network of fire warning towers. What everyone does agree, however, is that the weather conditions were crucial: “the rule of thirty ” was met (30 degrees, humidity below 30% and winds stronger than 30 kmph). When some dickhead lights a fire in a “dirty” forest in these conditions the potential result is catastrophic. Although it is possible that some of the firebreaks were not as clean as could be desired, all agree that little could be done once the fire started to rage. By far the biggest firebreak in the area is the River Tinto and its bare deforested banks, but the flames just leapt across it. Experts also affirm that most of the burnt surface area was made up of eucalyptus forest . These aromatic trees are steeped in resin. Under high temperatures and low humidity they become extremely inflammable. The eucalyptus has been used to reforest huge areas of Spain for the production of cellulose, but is being steadily abandoned in competition from cheaper paper from the Third World. If it is properly farmed there is no problem (firewise, in terms of biodiversity it's a disaster), but if left neglected, eucalyptus woods become a powder keg. Significantly, 80% of the burnt eucalyptus were neglected trees. In contrast, native holm oaks (encinas) resist fire much better. Many fire experts say fires need to be extinguished in the winter, i.e. the woods, pastures and paths need to be cleaned and cleared. Whatever the case, millions and millions of euros are spent every year on fire prevention and extinction, and every year thousands and thousands of hectares go up in smoke. When up to 90% of this loss is sparked deliberately and the authorities find it almost impossible to establish blame and secure convictions, one is left with the pessimistic conclusion that fire on a massive scale is fact of life in the Spanish summer months. Hopefully, the change of the current ‘Ley de Montes' (Countryside Act) in order to prevent burnt land from being reclassified as ‘urbanisable' for at least 30 years after the event, should put a stop to many of the scams surrounding blazes. While forests are expanding in much of northern Spain, the south appears to be condemned to more and more loss and consequent desertification. And its not just wildlife that suffers. Several of this year's forest fires will have dire consequences for local economies based on forestry and hunting. This is the certainly the case of the second most serious fire to affect Andalusia (and probably Spain) this summer: the 7684 ha burnt in the heart of the Sierra Morena , one of the most ecologically important areas of the country. Six pairs of Spanish imperial eagles inhabited the burnt hunting estates: The fire has decimated rabbit and partridge populations on which they live. The fire is a huge blow to the local economy whose principal asset is “big“ game (red and roe deer and wild boar). Thousands of animals perished during the blaze and it will take decades to return the area to its original wealth. The hunting estate owners have been slated for maintaining fences around their properties, which turned into veritable deadly traps for the fleeing fauna. The abandonment of traditional forestry uses such as charcoal burning, selective felling and forest grazing is a serious problem in many of Spain's forests. This is producing an overly-dense structure with too many small trees and a stagnated growth, perfect for the propagation of fire. Trunks with a small diameter burn particularly well, creating the type of blaze which is just about impossible to extinguish by human means. Trees are also decolonising marginal agricultural land, meaning that is just more to burn. We should of course not forget that lightning-induced fire is a natural part of Mediterranean ecosystem. Mediterranean forest is indeed resistant and to some extent dependant on fire, which may occur naturally every 5-30 years. But in its true and almost vanished form it is made up of large trees with plenty of space between each one, and with sparse undergrowth kept closely cropped by herbivores: a slightly denser version of the classic dehesa landscape, which itself is less prone to fire. Valencia and Galicia have also been badly hit by this year's fire. But it's not all been bad news. Catalonia has had its best year so far since 1970 with a mere 260 ha up in flame for the first eight months in comparison with the 9,719 of Jan-Aug last year. Plentiful and fortuitous rain, lower temperatures an alert fire brigade and an absence of pyromaniacs are all cited as reasons. Similarly, the Basque Country has also had one of its best years for a long time. Spring rains and summer showers have kept Basque forests humid, but improved government action has also paid its part: control of stubble burning; cleaning and clearing the forests of undergrowth and dead wood; and greater awareness on the part of the public. More on forest fires. Spain's environment minister Cristina Narbona has warned of a ‘complicated summer' in terms of forest fires. She repeated her promise to modify the current ‘Ley de Montes' (Countryside Act I suppose – see below*) in order to prevent burnt land from being reclassified as ‘urbanisable' for at least 30 years after the event, which should put a stop to many of the scams surrounding such blazes. Fire is of course a natural and necessary element in the Mediterranean forest but its regeneration depends on their frequency and severity. Around 90% of forest fires in Spain are lit on purpose or caused by carelessness and neglect. According to the INM , this year is probably not going to be anything like as hot as 2003. It has also rained a lot. Following recent trends, spring was wetter than average, and most reservoirs are near capacity. But this does not mean there is no risk of fire. Last year, despite being so hot, just (sic) 15,992 ha were burnt in Spain, well below the average of 38,469 ha since 1994. The figures for the first five months of the year are already 19,287 ha, 75% of which was matorral (scrub). Yes, fire rages best in hot, dry and windy conditions, but it also needs kinder. The moist conditions are favoring grass and undergrowth. If and when it stops raining for long enough and the new growth dries out, there's going to be plenty to burn in Spain's forests this year, though we all know that it won't be nature which will spark the vast majority of it. 1. m. Gran elevación natural de terreno. 2. Tierra inculta cubierta de árboles, arbustos o matas. "Fires continued to burn across the Iberian Peninsula on July 28, 2004. Along with scorching temperatures, both Portugal (occupies roughly the western quarter of the peninsula) and Spain (occupying the remainder of the peninsula) have been experiencing dangerous wildfires in late July. In Spain, at least two people were killed when their car was engulfed by a fast moving fire. 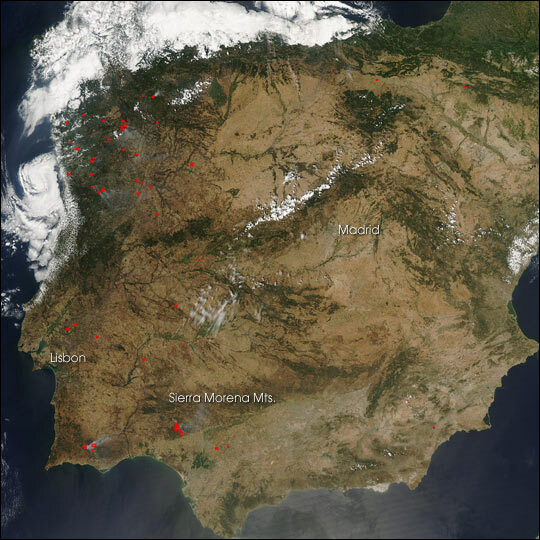 In northern Portugal (top left) numerous fires (marked in red) were detected by the Moderate Resolution Imaging Spectroradiometer (MODIS) on NASA's Aqua satellite when it passed over on July 28. To the southeast of Lisbon, a large fire is burning the Algarve tourist region along Portugal's southern coast. Across the border in Spain, a large fire is burning in the Sierra Morena".